How Far is Nice from Cannes? Both Nice and Cannes are two iconic cities on the French Riviera. They’re also the two most popular cities on the French Riviera, and where most tourists who choose to visit the French Riviera stay. The good news is that on the French Riviera, the distances between the different cities, places, and towns are quite short, and this gives tourists a great opportunity to explore and experience everything much of what the French Riviera has to offer. In this, a common question that is being asked is ”how far is nice from Cannes”. This is a question being asked commonly for many reasons. First off, a lot of tourists decide to stay in Nice due to it being a larger city, close to the airport, the ”capital of the French Riviera”, and so on, but at the same time, they’ve heard about Cannes, its delightful charm, its film festival, and the glitz and glamour, and dream of visiting. As such, they ask how far Nice is from Cannes. Something that’s not completely uncommon either is that some tourists move between different places to stay at in order to be able to more of what the French Riviera has to offer. 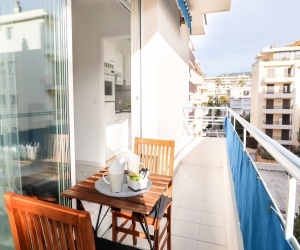 For example, they might start with staying in Nice due to its proximity to the airport, but then, they might stay a few nights in Cannes to explore more of the French Riviera. Now, in terms of distance, there are several ways to measure it, so it may differ. If you draw a straight line from Nice to Cannes, it is 26 kilometers (16 miles) from Nice to Cannes. However, since it’s not really possible to go the straight route unless you fly a helicopter (which doesn’t fly the straight line either). There are also two ways to answer this question. When it’s asked ”how far is Nice from Cannes”, it’s often the time that’s interesting, not the distance. But we’ll obviously share the answer to both. 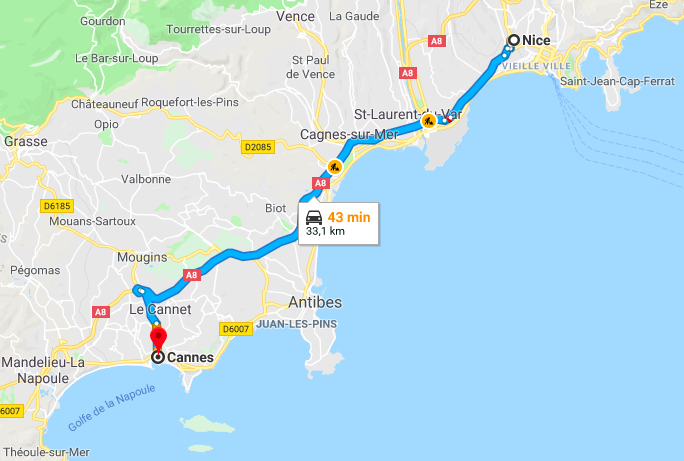 How far is Nice from Cannes if you take the car? It’s 34 kilometers (21 miles) by car from Nice to Cannes. This is the fastest way which goes along the A8 highway. So by car, taking the A8 highway, it will take 43 minutes and is 33,1km in distance. Going from Nice to Cannes by train is actually faster than going by car. Of course, this is not very surprising since, with a car, you often have to sit in traffic, red lights, and so on. The train goes fast and takes you to Cannes quite effortlessly in comfort. How far is Nice from Cannes by train? Well, in terms of time, its 34 minutes by train. It’s possible to take the bus from Nice to Cannes, however, the train is to recommend. It’s both much faster as well as more comfortable. The bus 200 is a coastal bus which goes between Nice and Cannes and only costs 1,50 euro. 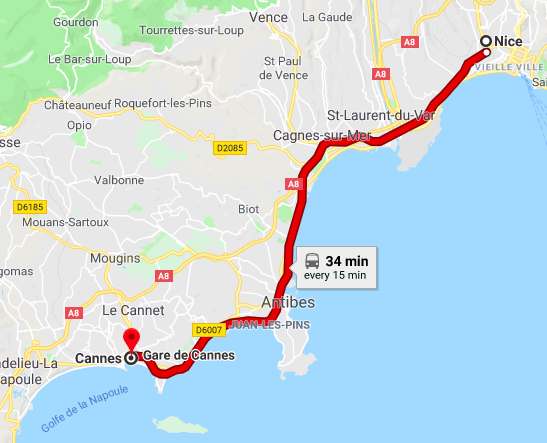 This is obviously the cheapest way to travel from Nice to Cannes, however, these buses are extremely slow, especially during rush hour, and in the worst case, you may sit on the bus up to two hours just to get to Cannes. The bus stops at a lot of stations, but red lights and traffic congestion are also factors that affect the bus’s travel time. The bus 200 leaves from the bus station near Place Messina for Cannes. Traveling from Nice to Cannes is popular among tourists, both as a daytime activity, but also for staying in Cannes for a few days. The answer to your question ”how far is Nice from Cannes?” in terms of distance first depends on how you define the answer. Is it measured in time or distance? Secondly, both the time and distance depends on which means of transportation you take.